Concerns about global warming and the depletion of oil reserves have led to significant research into more sustainable composite materials made from natural materials. Recently, research has focussed on the development of nanoscale reinforcements for this new group of composites, significantly improving and extending their range of desirable properties. Environmentally friendly polymer nanocomposites summarises this wealth of research and its practical implications. After an introduction to the subject, part one looks at matrix and reinforcement materials as well as their characterisation. Part two reviews key properties such as tensile and dynamic mechanical properties and thermal stability. It also considers issues such as barrier properties, biodegradability, rheology, electrical and thermal conductivity. The book concludes by reviewing potential applications. 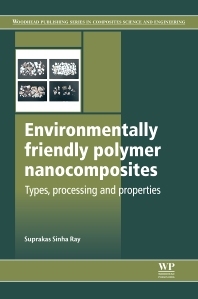 This book is ideal for polymer and material scientists, researchers and engineers. It will also help industrial researchers and R&D managers who want to bring advanced eco-friendly polymer composite-based products into the market. Professor Suprakas Sinha Ray is Chief Research Scientist and Director of the DST/CSIR National Centre for Nanostructured Materials, Council for Scientific and Industrial Research, Pretoria, South Africa.He received his PhD degree in Physical Chemistry at the University of Calcutta, India in 2001 and was a recipient of the ‘‘Sir P. C Ray Research Award’’ for the best PhD work. After three years of postdoctoral research at the Toyota Technological Institute in Japan, he spent three years as postdoctoral scientist at the Chemical Engineering Department, Laval University, Canada. Towards the end of 2006, he joined the CSIR Materials Science and Manufacturing group as Nanoscience Group Leader, in South Africa. In November 2007, he was promoted to Chief Researcher (level 2, highest position within CSIR S&T base) and founder Director of the DST/CSIR National Centre for Nanostructured Materials, CSIR, South Africa.